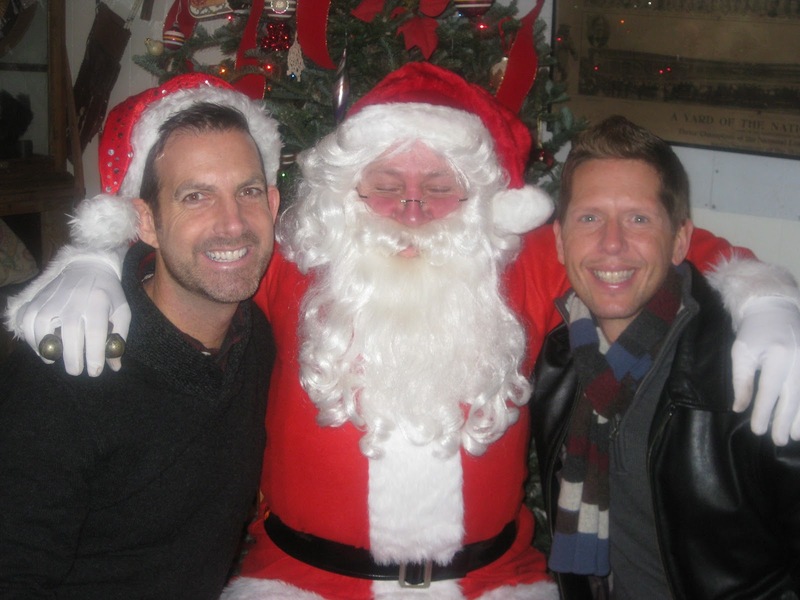 Chick Lit Central: Go-To-Gay: Oh, Christmas Tree(s), Oh, Christmas Tree(s)! Go-To-Gay: Oh, Christmas Tree(s), Oh, Christmas Tree(s)! As you can see by the picture to the right, our "Go-To-Gay," Wade Rouse, is a bit tuckered-out from a busy 2012. Whether he's promoting his books, writing, or teaching at one of his wonderful workshops or retreats, once again this year, Wade spread his life wisdom through his ability to make words come alive on a page and did so with an ounce of humility and a large dose of laughter. This year, by making the decision to attend one of Wade's writers' retreats (which took place in May) I received an early Hanukkah present. Not only did I gain more knowledge about the publishing industry as a whole, but I also gained a confidence in my writing that I hadn't had prior to the retreat. Wade taught me that the only thing keeping me from achieving my dream of becoming published was me. Also, he taught me that the first step to achieving any dream is getting over the fear of failure which is something, I believe, that keeps many of us from taking the chances we need in order to succeed. So, Wade, thank you for the time you gave me to move myself and all the others in attendance at the May retreat one step closer to fulfilling our personal dreams. At this time I'd like to take a moment to wish each and every one of you a very Happy Holiday Season, whatever holiday you may celebrate. I wish you peace, love and happiness AND that you give yourself the gift of fulfilling your dreams. Oh, Christmas Tree(s), Oh, Christmas Tree(s)! 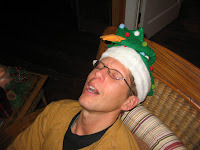 My partner, Gary, is a lot like Macy’s: He enters full holiday-mode while summer is still in swing. Gary is a serious holiday decorator. Martha-meets-Hoarders serious. We have – and I am not exaggerating – hundreds of color-coordinated crates to hold our annual holiday booty, from Halloween to Easter. Christmas, of course, takes up the largest chunk of our basement. Despite living on four acres of woods in the middle of a forest, Gary crams six trees into our already woodsy knotty-pine cottage and also decorates dozens of outdoor pines along with our window boxes, doors, dogs and neighbors. 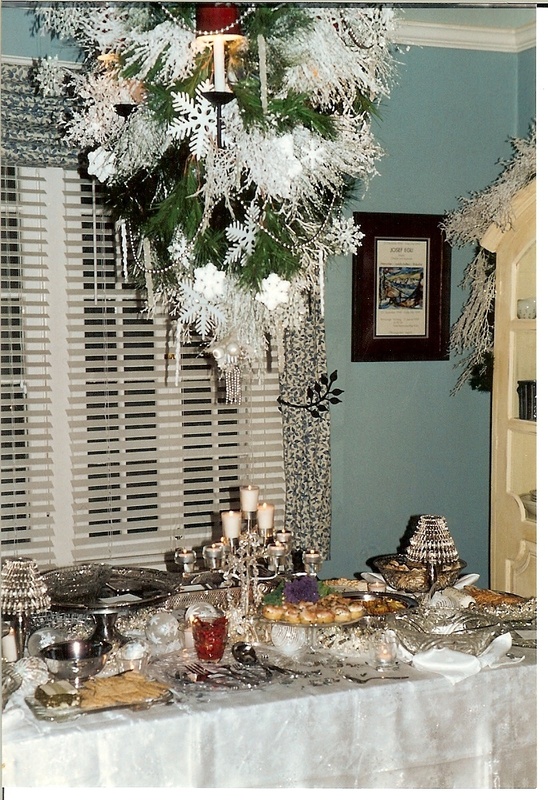 1) A White House-sized tree in the family room contains hundreds of our family’s vintage and heirloom ornaments. 2) A tree in our entryway next to the cottage’s original fireplace is home to a “lodge” tree, which holds “North Woods” ornaments that look like moose, cabins, canoes and fishing gear. 3) Our kitchen tree topples with food and cookware ornaments, from sugar-coated cookies and crystalline coffee mugs to happy S’mores in Santa hats. 5) The “garden” tree in the windowed walkway that leads to my carriage house writing studio holds a massive tree containing “nature,” like beautiful birds, studded spades and watering cans. 6) And the tree in my office is an homage to Charlie Brown: A tiny, tender tree decorated with a few, bright, shiny, vintage balls, a childhood blanket swaddled around its base. 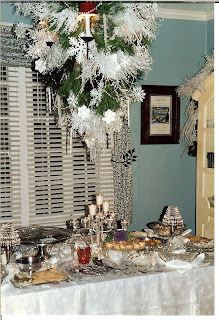 Every year as we decorate – swagging railing with pine boughs and pulling beloved ornaments from their little boxed homes – Gary and I share stories of our families, few of which are Currier & Ives moments. I grew up in an odd, Honey-Boo-Boo-esque Ozarks family that celebrated the holidays with extreme dysfunction: My father buried our Easter eggs and preferred only one color – Nyquil blue – be used to decorate the tree and house. As an adult, if I were to ask my mother for a gift from Banana Republic, she’d most likely wrap up moldy fruit. To wit: One Christmas, Gary received a pair of used, women’s Dockers from my parents, while I received Walgreen’s reading glasses and a carved monkey. Gary grew up in a family where the curtains and black-out drapes were always kept closed. He didn’t know if it were winter or spring, and friends rarely set foot in his house. And yet our families loved the holidays. More importantly, they loved us. As I lug box after box of ornaments up and down the stairs like a tortured elf, I always reflect on our families as well as those of our friends, some of whom lost their family after coming out, some of whom have recently lost mothers, fathers, husbands or wives and are struggling to find their way again, and some of whom are currently experiencing having the mantle of holiday traditions passed to them by an older generation. 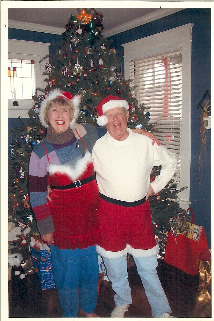 That is why – no matter the hours invested, money spent, exhausting work – I keep my mouth shut and celebrate these moments with Gary: I’ve learned, beyond the external beauty, there is a deeper shimmer to our holiday traditions. Which is why I laugh as I pull out the Precious Moments ornaments my mother bought us for some odd reason, and just as quickly I will cry because I miss her so much this time of year. Gary will sing “Hello, Dolly!” in honor of his late grandmother while he pulls out the fragile, antique, glass ornaments with which she used to decorate her tree. And I will always incorporate a little Nyquil blue – somewhere – for my father, who is no longer able to decorate his own tree. When we are finally finished, I will hold Gary closely, thank him for loving me and helping to create our holiday traditions, and then we will shut off all the lights in the cottage and walk from room to room basking in the light of something even brighter than our trees. You've done it again. Teared me up and made me reflect on real values we all need to share all year. Best to you both and a wonderful new year to come.